I would have to say you are too old to run hill repeats when you are too old to dance. And, yes, that was a trick question. When are you too old to do anything? Most people limit themselves much more in their heads and by inactivity than by actual physical limitations. Now, I’m not advocating that you go out and run hills when the most exercise you’ve had regularly is walking around in the grocery store. I’m not even saying it is a good idea to run hill repeats when your main exercise is swimming or yoga. 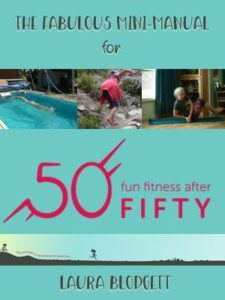 Those are fine exercises, but they don’t condition your body to running. Another thing I am not saying is to go do hill repeats (or speed intervals) to an extreme beyond your current training level. That is how you hurt yourself and discourage yourself. 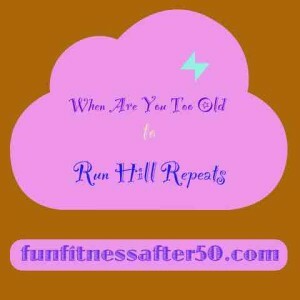 What I am saying is that hill repeats are completely possible, rewarding, and even to some extent fun if you have been running regularly, even if you are old enough to have grandkids. My husband and I added hill repeats to our running schedule a few weeks ago. There was no high pressure, although we are preparing for a half marathon September 24. While I knew that it would require some dedication, and be quite hard near the top of each repeat, I also knew that no matter how I “felt” I did, I would gaining strength and increasing stamina. When I indicated I might try to get in my normal 6 miles for the day, I was advised it would be better for my body if I put in those couple of extra miles the next day after a rest time. I did that and found it did not adversely affect my long run on the following day. In fact, it probably helped keep my legs loose. I gradually, although very slightly increased my interval hill repeat speed up until the last interval. Even the last hill repeat was very close in time though. At first, I didn’t want to time each hill repeat, but my husband encouraged me to. He was right that it was inspiring and motivating. I was able to see how perceived effort was sometimes different than timed outcome. For instance, the first hill repeat each day tends to be on the slightly slower side. Also, it was always nice to get to the top and find that even though one of the last hill repeats felt slower, it wasn’t. My Garmin watch is very easy to use for timing and resetting after such intervals. While I use it for that, my Strava app keeps track of my total distance. We are planning on making “our” hill a Strava segment for the fun of it. If no one else finds out about it for a while, maybe I’ll have the record for a bit?! One very nice thing about that particular hill (on Tio Lane in south Nampa) is that it is on the end of a country road. There is barely any traffic, although the last time we ran it there were some trucks involved in harvesting the field along it. Thankfully, the trucks were not there long, as the smell of diesel was going to be a problem for me. Another hill that is convenient for hill repeats is the one on Sunnyridge Road. It is shorter, but steeper than the Tio Lane hill. I have run the Sunnyridge hill as part of a several mile run many times, but I used it for hill repeats today. Because it is so steep (it is not uncommon to see cyclists walking their bikes up the last bit), I made no attempt to run up it fast. I did repeat it 6 times, and by the last time, my calves were feeling crampy. Maybe after I do repeats on it a couple more times, I will start timing myself. I could also make a segment out of it and look at my results on that after the fact. For the record, I wore my Luna sandals for all of these hill repeats. The roads there are sharp chip seal and gravely. I guess I have verified that I am not too old for running hill repeats. And it probably helps my dancing! I danced for quite a while on a recent Saturday night. I got lots of questions afterward from women who wanted to be able to dance with the same energy. A couple of young women made sad faces when I pointed out that running 30 plus miles a week is one thing that *gives* me energy. It seems that even young people seem to think that certain levels of activity are beyond them. Maybe they will discover how to gradually increase their exercise capability. Then, when they are old like me, they can dance the night away! If you found my post encouraging, please share it! I had expected a resort town with a reputation such as Palm Springs has to have a more developed system of walking or biking paths. However, neither visual reconnaissance or internet search revealed anything other than sidewalks designated as such pathways. Doing an internet search specifically for running routes showed unappealing road routes that others had run. There quite a few trails on an Indian reservation just a couple of miles outside of Palm Springs proper. When we were there, there weren’t so many hikers as to make a trail run difficult. I also saw some bike paths in adjacent cities. But we were staying deep enough in Palm Springs that the drive to those for a morning run was too inconvenient. A couple of Palm Springs activity websites said there were paths, which upon investigation turned out to be sidewalks. Some of these were on the wide side, while some were double, creatively intertwined side walks with painted labels. I decided to try a barefoot run on them. 8 AM on a November morning seems to be a good time to go for a run in Palm Springs. The weather was mild, but sunny. The traffic was minimal. It was too early for the downtown shops along Palm Canyon Drive to be open and I needed to pass through that section to make it to the so-called paths. There was no reason to stop at most side streets. The main road I was looking for was E. Tahquitz Canyon Way (ETCW). It was about 1/2 mile from our lodging. It turned out to be a wide semi-residential road. While there were a few businesses scattered along it, most of the part I ran on was bordered by and gave access to quiet neighborhoods. For being as wide as it was, there were not many cars. There were a couple of small patches of glass by vacant lots, but other than that, this stretch of sidewalks was clean and fairly smooth. It was very comfortable for my bare soles. When I got about half way along ETCW (according to what I had seen on the map), it intersected with S. Sunrise Way (SSW). The description of the paths said SSW was one leg of the path system. I made a quick decision to turn right since ETCW had been so straight. If I ever go back to this route, I will probably try staying on ETCW. SSW turned out to be where EVERYONE was. Driving, grocery shopping, banking, you name it. I was frustrated by needing to stop at multiple roads and driveways. Then, I noticed that there were quite a few walkers on the other side of this busy street. After running through a sand lot due to lack of sidewalk, I found a signal and crossed the busy street. This turned out to be better, although still not as peaceful as the ETCW. Still, it was nice to be greeted by some smiling faces and use the randomly curvy sidewalks. In some places it split, one side labeled specifically for bikes. I came across a couple sections of broken bottles along this part, in spite of it being apparently in a high end area, but it was completely manageable and I passed through unscathed. I had my Strava app monitoring me, so was able to check on my mileage. I was surprised to see I had run 3.5 miles at this point. It had felt relatively effortless. Maybe it was that my normal altitude is around 3000 feet above sea level. Possibly, I was just well rested. Regardless, I felt light footed this day. Because I had people waiting on me for the day’s activities, I turned back toward home base. I think I saw three other runners that morning. All of them were my age or older, but it keeps getting harder for me to tell. I frequently don’t feel my age, whatever that is supposed to mean. None of the other runners looked like they were having anywhere near as much fun as I was. No one said anything about my bare feet. As I re-entered the downtown touristy, small shop area, the cafes were busier serving breakfast and pedestrian traffic was on the rise. I had to stop for a red light at one of the last large intersections, and while waiting there a brightly outfitted, heavily make-uped woman in her mid 70’s approached me. She asked if I knew where such-and-such casino was. I must have looked as surprised as I felt at the question, because she got defensive and grumbled, “Well, you looked like you would know.” And walked off. All I can figure is that she thought someone running around like I was must know their way around town. I was very interested in dancing while in Palm Springs. I love to dance, and all the advertisement of possible night clubs or pubs with dancing made it seem like we might find something good. We went out on a Friday night to choose a place. Call it the story of The Three Dance Clubs. 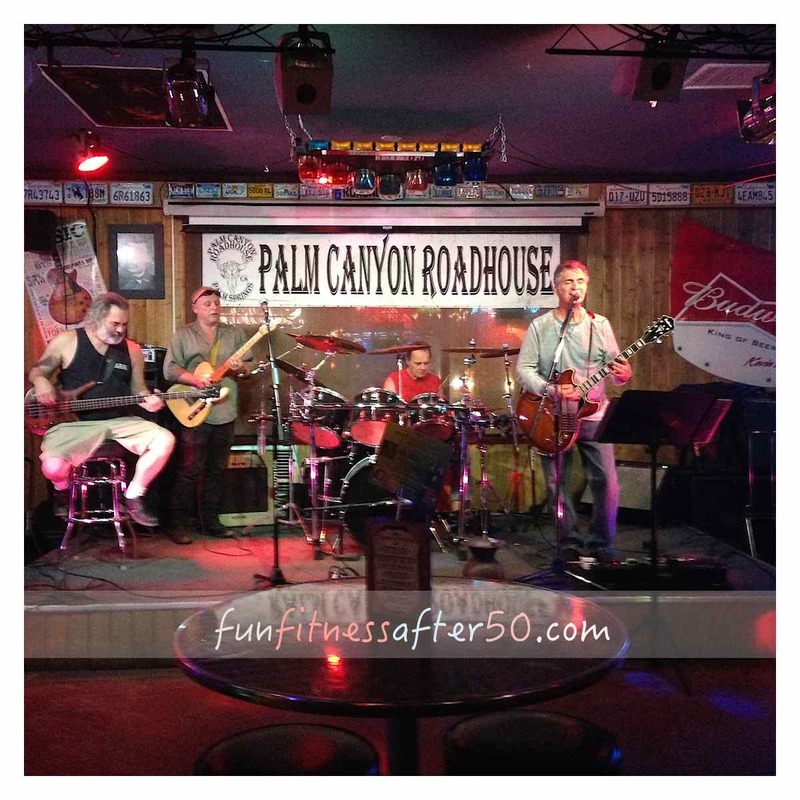 The first place was an open-air chic corner pub in the small shop area of Palm Canyon Drive. (Village Pub) We could see and hear the band from the sidewalk. They did not quite have the consistent rhythm for dancing, although they had potential. They just needed more practice and confidence. The overall ambience was friendly and inviting. We put them on the list for a possible return. It was almost a mile walk to the second place, a night club with a more the mysterious entrance. (Zelda’s) The black curtained windows hid anything going on inside. It sounded like they were mostly playing rap music, and the patrons we could see entering looked like a cross between James Bond movie wannabes and 1930’s 20 something gangsters. The cover charge to even get in the door was more than we wanted to pay for further evaluation. The name of the pub is behind the band on the stage. Fortunately, we had passed another basic pub, or bar, on the road while walking. There was some excellent danceable rock-n-roll bursting out of it. I really cannot comprehend why there were not people dancing in the street. The four piece band was playing with the relaxed gusto of skill combined with love of music. 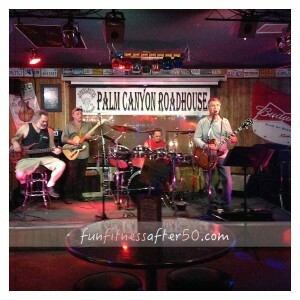 We went in to Palm Canyon Roadhouse and had the floor to ourselves. I was initially barefoot, but after several minutes the bouncer came over and insisted I put on footwear. Something about “glass all over the floor.” The floor was immaculate. One would have thought getting customers in their basically empty establishment would have been more important. It was the ONLY place in Palm Springs that made me put on footwear. Ruth Chris’s Steakhouse had even accepted me barefoot. Since my dear husband had gone to a lot of effort to take me out to dance, I acquiesced to him getting my Luna sandals from the car. He had to walk half a mile to where we were parked. After chewing on my frustration for a few minutes, I got back to dancing, which included a lot of sliding around on their very smooth floor. It would have been ironic to have slipped and hurt myself due to footwear, but I avoided it. One of the band members gave me his card during a music break. The band does not have set members. Jos Burrell (link above), on the guitar, and the drummer, Chris Sigwald, are the core of the jam sessions at the roadhouse. That night there were two more guitar players, who also participated in the singing. I wanted to put them all in my suitcase and take them to Idaho with me! If I go back to Palm Springs, I won’t look for a place to dance, I will look for whatever form of this band is playing. 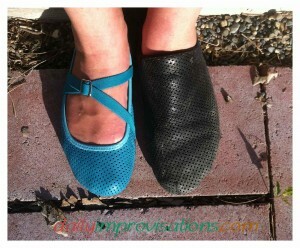 My new comfy ballet flats and my running moccasins, both made by Soft Star Shoes. When the opportunity presented itself to review a pair, I spoke right up. I specifically wanted to evaluate how the Ballerines would work for dancing. I was a little concerned about how they would stay on, being the basic cut of ballet flats, with less coverage over the top of the foot. 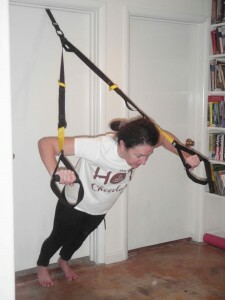 When I learned that there was an option for a “sport strap,” I was pleased. I chose a vivid turquoise with the sport strap. 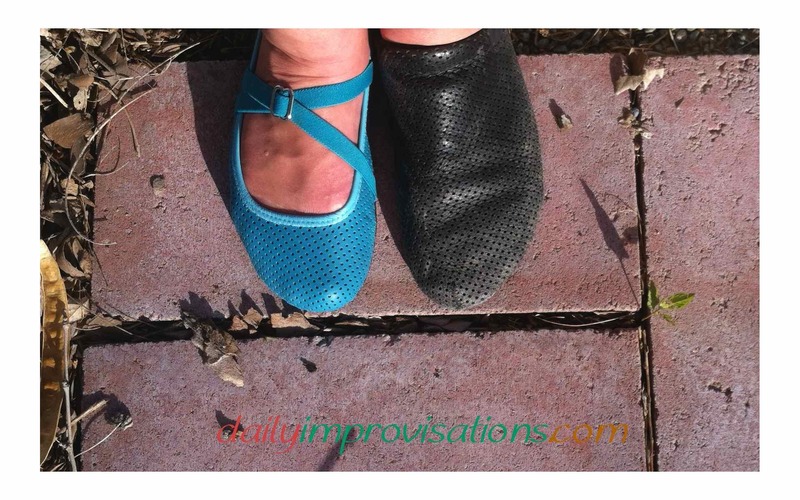 With my heels solidly against the board, I compared the toe boxes of the two styles. I have larger than average feet for a woman, in the past having been a standard size 11. I say in the past because with all the time I have spent barefoot in the last 3-4 years, my feet have spread. I can tell when I look down that my toes are more spread now, from all the good work that they do helping me keep my balance and run with good shock absorption. Standard shoes that I could previously wear are now much too tight across the ball of the foot. It is not just a matter of not being used to them. They don’t fit the same. In years past, it was also a common frustration that the cute little size 7 shoes on the display racks simply did not look so cute on my feet. At least in my opinion. The designs often accentuated length and made me feel like a clown. So, I am very aware of how certain design features grow on a larger shoe. Why do I tell you all of this? Because I didn’t have any of these issues with the Ballerines. In particular, the sport strap does nothing to make the shoe look or feel bulky. 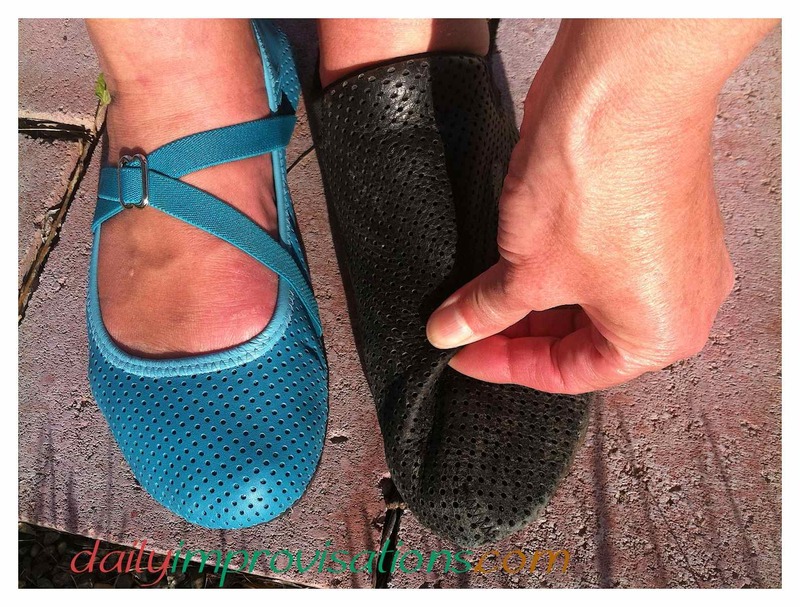 It blends nicely with the look, is easy to adjust, and makes the shoes feel secure without feeling tight. Shifting my weight toward forefoot didn’t make a difference in how they felt. Even though I have ordered Soft Star shoes in the past and fit perfectly into their shoes that matched a women’s size 11, the Ballerines did feel snug on me. The company has changed their sizing since I ordered last time, just in the range of my size, but I decided to try what was listed as for a women’s size 11 still. I tried on my Soft Star RunAMoc’s and Moc3’s to compare fit, to see if I could pinpoint what the difference was. These older shoes of mine still fit quite comfortably, with plenty of room in the toe box. It is true they may have stretched some with use, though. I don’t have any noticeable difference between my right foot and my left foot, so I put one Ballerine on and one Moc3 on. I stood outside against a straight edge to make sure the heels were even. I could see the somewhat different toe box shape of the Moc3, and I could see how my big toe pressed more into the end of the Ballerine. I could also see how the toe box of the Ballerine curved in and around the toes sooner than the Moc3’s. I found that the leather on top of the Moc3 was loose enough to be able to pinch some. 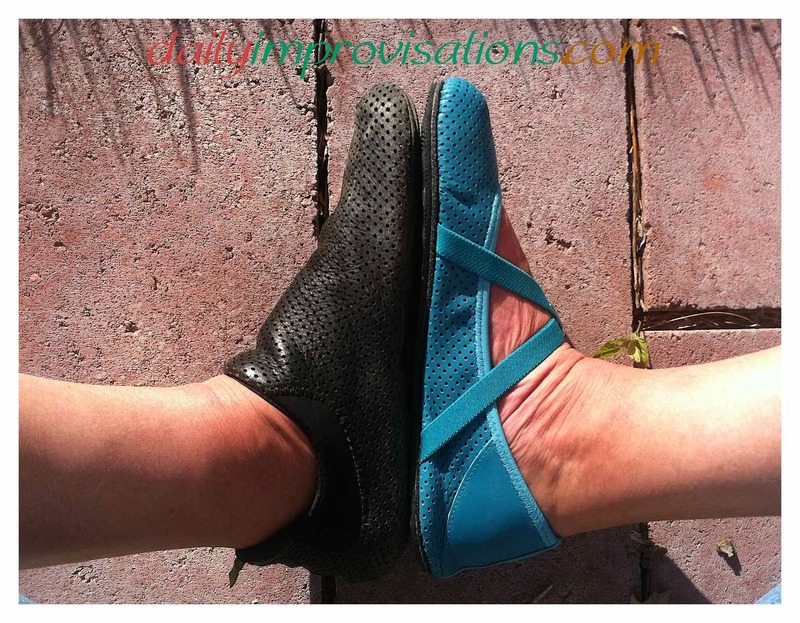 I could not do this over the toes on the Ballerines while I was wearing them, but when I turned my foot sideways to compare, it was easy to pinch some there. The leather was nice and soft. Yes, those are still both my feet. I was feeling particularly flexible. 🙂 I don’t think I got my heels exactly even, though. I also emailed the company to ask their opinion. They explained the cut of each shoe design may vary slightly, favoring one basic foot type or another for different sizes. They also wear their own shoes and have experience with the leather shoes stretching as they are worn. The Ballerines were not uncomfortably snug. I suspect that someone who is used to wearing shoes would not think them snug at all. I wore them around the house and periodically forgot I was wearing them. Shopping was the next test for the Ballerines. I went to Walmart and walking was quite pleasant in them. They have a very flexible sole that is hardly an ⅛th of an inch thick. A padded insole of about the same thickness does not detract from this flexibility or give any feeling of height. In short, they felt like princess slippers. Turquoise princess slippers. Dancing was on the agenda for the evening. I knew the place we were going let me dance barefoot, but I thought it would be useful to be able to compare the shoes with being barefoot the same evening, under the same conditions. So I took them. Pinching the leather on the top of the well worn Moc3’s. The large dance floor was wood, fairly polished and smooth. I can dance on it very actively with bare feet and don’t get any slivers or hit any ridges. I started out dancing with the Ballerines on. This was not quite as comfortable as walking had been. The snug fit of the shoes kept my toes from being able to spread like they normally would with all the dance movement. I was pleased that the soles were not so slick on the wood so as to send me flying, but not so grippy so as to hamper my moves. After a couple of dances, I let my toes free. Two of my young adult daughters, who have feet just a little shorter than mine, have tried on these Ballerines, and are interested in my new, cute shoes. They also run mostly barefoot, and work in very minimalist shoes in the restaurant industry. I haven’t quite decided if I will pass these shoes on to one of them and buy the next size up to try for myself, or try to wear these more for walking and see if they stretch. They are still clearly the most comfortable ballet flats I have worn. If I do buy another pair, I still think I’ll order turquoise! And I will be trying dancing in them. It makes me feel a little guilty. Nearly every time I go out dancing, someone compliments me, asking something like, “Are you are a professional?” or saying “You are amazing!” Last week, a couple that I had never met was having enough fun watching me that they bought me a drink. The truth is there is one secret to my dancing they are all probably overlooking, even though it is staring them in the face. I do it barefoot. People often make statements about being barefoot being “tough,” but I really do it for the opposite reason. I go barefoot because it is easier. Sure, it may take some getting used to some surfaces and conditions, but from the very first I noticed that my balance was better. This has a great impact on dancing. I have always loved to dance. I love the story my dad tells about me dancing at an outdoor concert my parents were at when I was 4 years old. Oblivious to all else, I danced for a long time. I may have been barefoot, since it was southern California. I know my mom says they didn’t put shoes on me at all until I was over a year old. But as an adult, I didn’t start dancing regularly until about 3 years ago. Up until then, I had kept up with exercise, including some of those aerobic classes that do their best to make you trip on a raised platform. I had danced at an wedding or similar type event every few years, broken out in the kitchen once in a while, or gotten a little light footed in the grocery store aisles, but just going out to go dancing was not on the typical weekend agenda. Then, the kids grew up, and my husband and I could go out without a babysitter. Soon, we went on a cruise that had a lot of dancing floors. 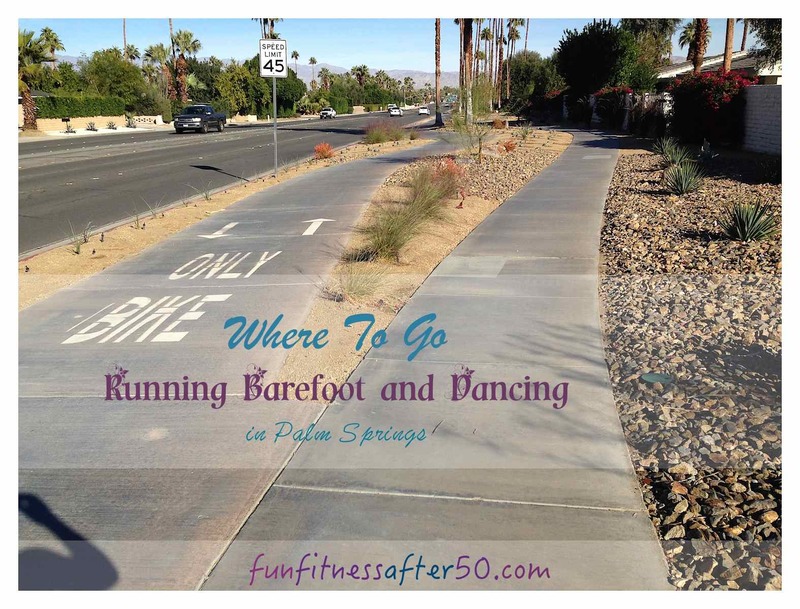 I turned 50 and started to go run barefoot. I began training for triathlons and half-marathons. These things all aligned to remind me of dancing and make it extremely fun. Still, at first, I couldn’t dance for more than a couple of songs without getting winded. Running training was not quite the same as the pace at which I dance. I’ve never had any dance training other than a dismal semester of ballet in college. My husband and I did try a couple hour long free salsa dance lessons, but found the repetition to be boring. He was not at all interested in any other ballroom type dancing. It looked like it was free form rock-n-roll for us. Going out every 2-4 weeks, I soon found that I could dance for a 2-3 hours, with only a few breaks, and without taking three days to recover afterward. Gradually, I began to experiment with “new”moves, just for fun and variety. I noticed that being barefoot gave me quite a bit more mobility due to balance. With this new mobility and increasing dance stamina, I did more creative things with my legs. I even ventured cute little kicks, low to the ground, when the music just seemed to call for it. No one else was doing any kicking, so it was very brave of me. Now, about three years later, I can kick in a controlled way as high as my husband’s shoulder. I have even begun to be able to hold my legs in a waist high position for a few moments, to add extra flare to a dance move… I did not make any effort to make this progress. In fact, it was just last month that I realized how much of a change had taken place. I recalled that I have never been very flexible. I have always been frustrated by stretching associated with other exercises and finally gave it up a while ago after happily reading that it might be harmful. I’ve never done any yoga or “balancing exercises” other than trying to kill myself on one of those half-balls in the gym. I had shoes on then. No one should stand on those balls while wearing shoes. There have been a couple of establishments where they asked me to put shoes on, which I complied with by wearing some thin-soled leather Vibrams (until I lost them when I left them accidentally at a location where they let me stay barefoot), my Moc3’s (which I gave up because I just couldn’t deal with their look when wearing a skirt), then finally settled on my Luna sandals, which let my feet breathe and look much better with dressier attire. The sandals still let me have the balance advantage of full toe spread, but I do have to be a little bit more careful of slipping. The soles of my feet may look smooth and leathery, but they are pretty grippy, too, on most surfaces. The only times I have been hurt by other people’s shoes were when they knocked me in the ankles, something I could only protect myself from if I wore combat boots. The ladies in high heels do look scary, but they can’t really move and if they fall they tend to go straight to the ground. To date, I have not fallen over once. I have seen several other women and men in shoes fall down, and most of them were not drunk that I could tell. My husband did step on my toes once, but it wasn’t that uncomfortable. Since I am moving around a lot when I dance, I have made a habit of constantly looking all around me. I do a bit of twirling, too. What can I say? I have figured out how to “spot” my turns so that I don’t get dizzy. Twirling is definitely easier in bare feet, too, because being able to end the twirl on feet that are ready to absorb any slightly miscalculated motion is invaluable. To add to the fun, my husband and I have gotten to the point where we can read each other’s moves sometimes and it looks like we know what we’re doing. I think it is like our own little tango. I have danced barefoot on empty dance floors, where I could use the whole space, and crowded dance floors. I’m usually very warm, so the bare feet help me cool off, too. If the dance floor is empty when we start to dance, someone else often sees how much fun we are having and figures if we are already out there, they won’t feel out of place. So now you know my secret. Dance barefoot. You will be safer and have more fun. You will find keeping your balance comes much more naturally, and you might even accidentally get a little more flexible! It takes some planning and problem solving to keep up our physical strength during the winter. In this article for D&B Supply, I offer some encouragement and guidelines for not turning into a marshmallow that can’t wield a shovel in the spring!